Mary’s elder brothers were Thomas Goldsborough MP & Rev Godfrey 1548-1604 Bishop of Gloucester." They had no children but both left wils." [S5005] Website Ancestry: Ancestry.com. England, Select Marriages, 1538–1973 [database on-line]. Provo, UT, USA: Ancestry.com Operations, Inc., 2014. [S3816] Will of John Paske. "Documents Online www.nationalarchives.gov.uk Catalogue Reference PROB 11/98 Image Reference 85/550." [S3816] Will of John Paske. "Will available, but not yet transcribed." [S5005] Website Ancestry: Source Citation: The National Archives; Kew, England; Prerogative Court of Canterbury and Related Probate Jurisdictions: Will Registers; Class: PROB 11; Piece: 98. Held by: The National Archives, Kew. [S4868] Pedigree of the Family of PASKE of the Counties of Cambridge and Suffolk compiled c1885. Spans 10 generations from the early 1500s to 1884. Kindly provided by Gresham Stuart Pask in April 2014. [S271] Website Paske (Eardley Bryan) (http://web.ukonline.co.uk/ewh.bryan/paske.html): "Alice m Richard Hearne, Alderman of London, died 1629 and buried with her husband in St. Vedas, Foster Lane." He died 1601 Cambridge, having married Mary Goldsborough d 1593 Cambridge. Mary’s elder brothers were Thomas Goldsborough MP & Rev Godfrey 1548-1604 Bishop of Gloucester." Research Note: No other information currently found in Ancestry, Probate Records at TNA, or FamilySearch. [S2657] E-mail from Colin Cornes to Stuart & Teresa Pask dated 25 September 2010: Information copied from pedigrees given in 16C visitations, with many contemporary misspellings - "John jr & Mary’s eldest son was John gent & draper Cambridge 1565-1630 But I am descended from a younger son Rev Thomas 1585-1662 who was Master of Clare College Cambridge." 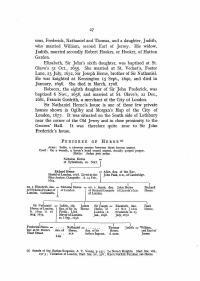 [S285] Website FamilySearch Internet (http://www.familysearch.org) : "England Marriages, 1538–1973 ," index, FamilySearch (https://familysearch.org/pal:/MM9.1.1/NJ1D-HH3 : accessed 20 Aug 2014), John Paske and Margerett Overton, 07 Oct 1604; citing Saint Edward,Cambridge,Cambridge,England, reference ; FHL microfilm 496690. In 21 December 1606 he was ordained as a priest in Lincoln. Between 1606-1611 he was vicar of Hendon, Middlesex until his younger brother William succeeded him on 9 September 1611. In 1609, he became chaplain to the bishop of London. Paske, Thomas (d. 1662), Church of England clergyman, was probably born in Cambridge, a younger brother of William Paske (d. 1639), who was admitted as a scholar from Eton College to King's College, Cambridge, about 1594, and who graduated BA in 1599 and proceeded MA in 1602. Thomas was a scholar of Clare College, Cambridge, who graduated BA in 1602 or 1603, was elected a fellow at Christmas 1603 and proceeded MA in 1606. He succeeded William as vicar of Hendon, Middlesex, on 9 September 1611 and became chaplain to James Hamilton, marquess of Hamilton. He resigned his fellowship in 1612, but returned to Cambridge to proceed BD in 1613. Revd. William Paske Doctor of Divinity. 2nd son. Clare Hall, Cambridge. Arms granted by Sir W. Segar 1630 & after him to his brother Thomas D.D. "Thomas Pask, prebendary of Canterbury, account of"
Following the English War "...parliament resolved to purge the university of Cambridge...."
"The town of Cambridge was in the interest of Parliament, but the colleges were so many little garisons for the King and sanctuaries of disaffection. The university press was at his majesty's disposal and their sermons filled with invectives against the two houses. Frequent quarrels happened between the townspeople and the scholars, which would have ended in the ruin of the university, had not parliament forbid any violence to the colleges, chapels, libraries and schools, under severe penalties. Indeed the Committtee put into execution the ordinance for destroying the relics of superstition, whereby the paintings in windows, images of the deity and a great deal of carved work were demolished; at which the masters and fellows were so incensed. that when they were ordered to repair the damages they peremptorily refused, were fined 40s a college as the ordinance directed." "...the heads of the university raised a great clamour at this invasion of their rights, as if the parliament intended to seize all their revenues and destroy the very fountains of learning...etc"
However, the purge proceeded and a number of Loyalist masters were turned out of Cambridge colleges, among these: "Dr Thomas Pask"
...Dr Thomas Pask from Clare Hall, also eminent for learning..."
"Thomas Pask D.D. He was master of Clare Hall in Cambridge, Arch Deacon of London and Rector of Much Hadham in Hertfordshire; all which he lost in the Civil wars; but was restored to them again on the Restoration. "Thomas Lord Middleton elected member of parliament for the University of Cambridge December 19th 1720 in the room of Dr Thomas Pask, deceased." "Dr Thomas Pask, Chancellor of the diocese of Exeter and official to the Arch-Deacon of London"
More Information: Adm. at KING'S (age 17) a scholar from Eton, Aug. 24, 1594. Of Cambridge. Matric. c. 1594; B.A. (? 1598-9); M.A. 1602; B.D. from Clare, 1609; D.D. 1618. Fellow of King's, 1597-1606. Ord. priest (Lincoln) Dec. 21, 1606. V. of Hendon, Middlesex, 1606-11. R. of Ashdon, Essex, 1611-39. Chaplain to the Bishop of London. Preb. of St Paul's, 1618-39. Died 1639. Will proved (P.C.C.) Sept. 4, 1639. Brother of Thomas (1602-3). (Newcourt; Shaw, I. 312.). [S332] E-mail from Colleen Morrison to Stuart & Teresa Pask dated 24 November 2015. Archives GL, 4383/1/350 · LPL, MS 943/599. [S4872] Will of Alice Hearne. Kindly provided by Peter Whitlock of the Whitlock Family Association. [S4873] Transcript of Will of Alice Hearne. Kindly provided by Peter Whitlock of the Whitlock Family Association. 1631: PASKE, Samuel, of p.St. Peter Westcheap, Lond., (citizen and merch.tailor). Will [38 St. John] pr. Ap. 21 by relict MARTHA. P.r brother WILLIAM. [S4875] Will of Samuel Paske. "Will available, but not yet transcribed." [S4874] Will of William Paske. "A copy of the will is available, but not yet transcribed." Will of William Paske, Doctor in Divinity of Ashdon, Essex. [S275] Website Cambridge University Officers (http://www.cus.cam.ac.uk/~jld1/lists/) : Caput Senatus: "1648 LLD Paske, William CL F.; LLD 1648." [S6] Teresa & Stuart Pask's Guesses, Theories and Speculations: Based on parents marriage, and other siblings birth dates. [S271] Website Paske (Eardley Bryan) (http://web.ukonline.co.uk/ewh.bryan/paske.html): Samuel m Martha Burnham of London. [S6] Teresa & Stuart Pask's Guesses, Theories and Speculations: Based on the ages of his children. [S4875] Will of Samuel Paske. "A copy of the will is available, but not yet transcribed." Collection: London: St. Benet & St. Peter, Paul's Wharf - Register of Burials, 1607-1837 (Burial). [S271] Website Paske (Eardley Bryan) (http://web.ukonline.co.uk/ewh.bryan/paske.html): "Frances m Robert Bowles of Cambridge." [S285] Website FamilySearch Internet (http://www.familysearch.org) : "England Marriages, 1538-1973 ," index, FamilySearch (https://familysearch.org/pal:/MM9.1.1/V5VB-4W7 : accessed 18 Aug 2014), Richard Herne and Alice Paske, 18 Feb 1592; citing Saint Lawrence Jewry And Saint Mary Magdalene Milklondont,London,London,England, reference ; FHL microfilm 374468, 942 B4HA V. 70, 942 B4HA V. 71, 942 B4HA V. 72. [S285] Website FamilySearch Internet (http://www.familysearch.org) : "England Births and Christenings, 1538-1975," index, FamilySearch (https://familysearch.org/pal:/MM9.1.1/NP2M-1VZ : accessed 20 Aug 2014), Alice Herne, 17 Jan 1602; citing ST VEDAST FOSTER LANE AND ST MICHAEL LE QUERNE,LONDON,LONDON,ENGLAND, reference ; FHL microfilm 845240. [S4878] Will of Richard Herne. [S273] Website Research on the Father of William Hearne the Merchant (http://www.cragun.com/brian/hearne/resources/…) : Letter dated 13 Jan 1981. [S271] Website Paske (Eardley Bryan) (http://web.ukonline.co.uk/ewh.bryan/paske.html): "Margaret m Thos Monke of Cambridge." Both brothers gained steady preferment. William Paske, who had proceeded BD from Clare in 1609, became chaplain to the bishop of London and in 1618 proceeded DD and became a prebendary of St Paul's Cathedral. On 31 December 1620 Thomas Paske was elected master of Clare. He was incorporated DD in 1621, and two years later became vice-chancellor of the university. He was instituted to the vicarage of St Mary Magdalen, Bermondsey, Surrey, in 1624, although he retained Hendon until 1626. In 1625 he became a prebendary of Canterbury Cathedral and succeeded Thomas Aylmer both as archdeacon of London and in the living of Much Hadham with Little Hadham, Hertfordshire. Following his presentation to the prebend of Ulles-kelf in York Minster on 10 November 1628 the fellows of Clare petitioned for, and obtained from Charles I some time before 2 September 1640, permission to elect a successor as master of the college, but no such appointment was made. Paske continued to be active in the southern province: several sets of his visitation articles as archdeacon of London survive. By the later 1630s he had taken up residence in Canterbury. In the spring of 1640 he was one of those delegated by Convocation to the difficult task of revising the book of subsidies. Absent from the November 1640–February 1641 session of Convocation, he was present again in April and May 1641. By 1641 Paske had married his wife, Anne; a daughter, Elizabeth, was baptized at Canterbury Cathedral on 12 February 1641 or 1642. Following the outbreak of the civil war, as subdean of Canterbury he complained on 30 August 1642 to Henry Rich, earl of Holland, about the ruthless treatment of the cathedral by troopers of Colonel Sandys's regiment. In the dean's absence Paske had been ordered by the parliamentary commander, Sir Michael Lindsey, to deliver up the keys, upon which ‘soldiers entering the church giant-like began a fight with God himself’ (Fifth Report, HMC, 45). His communication to Lord Holland was published on 9 September as The Copy of a Letter Sent to an Honourable Lord, by Dr Paske, Subdeane of Canterbury, London, but he told the House of Lords on 17 September that it had appeared without his knowledge. By 16 May 1643 pressure from parishioners at Bermondsey had succeeded in having Paske replaced by the lecturer there, Jeremiah Whitaker, and by 20 December that year Paske had also been sequestered from Hadham. In 1645 he was ejected from Clare College in favour of Ralph Cudworth; he also lost his prebends. David Lloyd states that Paske ‘suffered cheerfully for his majesty and his son for eighteen years’ (Lloyd, 504); he evidently had means to support himself and his family. His wife, Anne, and four children (including Elizabeth and Thomas, baptized in 1643) were awarded a fifth from Much Hadham in September 1644. The following year Paske was assessed at £400 by the committee for the advance of money, but the family were later reported to have moved to a house in Hadham which was better than the rectory, and the committee for compounding failed to oust him; at least three further children were born in the parish—Theophila (bap. 1644 or 1645), Judith (bap. 1646), and George (bap. 1650). Articles were exhibited against Paske for using the prayer book at ceremonies for the family of local landowner and royalist leader, Arthur Capel, Lord Capel (d. 1649). At the Restoration, Paske was reinstated in the rectory of Hadham, in his two prebends and archdeaconry, and in the mastership of Clare, but he surrendered his right of restitution to the last to the ejected master, Theophilus Dillingham, who, on 30 March 1661, married Paske's daughter Elizabeth. The same year Paske also resigned his York prebend to his son-in-law. On 24 June he attended the lower house of Convocation, but in December, probably because of illness, he subscribed by proxy. He issued visitation articles for his London archdeaconry in 1662, but drew up his will on 12 September and died within weeks; probate was granted on 19 November. The main beneficiary was his son Thomas, but there were bequests to three younger children and to the poor of Much Hadham; his wife was the executor. Paske was reputed to be eminent in learning, judgement, and piety, to be a great teacher, to have modestly refused a bishopric, and to have accepted unwillingly his other preferments. According to Lloyd, in one day during his final illness he was visited by three bishops, four privy councillors, two judges, and three physicians, all former pupils. "Thomas Paske D.D. (died 1662) was an English clergyman and academic, deprived as a royalist. He was perhaps son of William Paske, vicar of Hendon, Middlesex, and may have been born there, but the registers do not begin until 1653. William Paske left Hendon for the living of Ashdon, Essex, in 1611; he died before 15 February 1639-40. Thomas was a scholar of Clare Hall, Cambridge, and fellow between Christmas 1603 and 1612. He graduated B.A. in 1606, B.D. in 1613. He succeeded William in the vicarage of Hendon on 9 September 1611, and became chaplain to James, Marquess of Hamilton. On 21 December 1621 he was elected master of Clare Hall, and was incorporated D.D. in 1621. In 1625 he succeeded Theophilus Aylmer (d. 1625) both as archdeacon of London, and in the living of Much or Great Hadham, Hertfordshire, to which Little Hadham was then attached. He was also vicar of St. Mary Magdalen, Bermondsey. Paske was presented to the prebend of Ulleskelf in York Cathedral on 10 November 1628, and to a stall at Canterbury about 15 December 1636. He took up his residence at Canterbury, and the fellows of Clare consequently petitioned for and obtained from Charles I, some time before 2 September 1640, permission to elect a successor; but no appointment was made until 1645, when Ralph Cudworth was put in by Parliament. Paske was also subdean of Canterbury, and on 30 August 1642 complained to Henry, Earl of Holland, of the ruthless treatment of the cathedral by troopers of Colonel Sandys's regiment. In the absence of the dean, he had been ordered by the parliamentary commander, Sir Michael Lindsey, to deliver up the keys. This communication to Lord Holland was published as The Copy of a Letter sent to an Honourable Lord, by Dr. Paske, Subdeane of Canterbury, London, 9 September 1642. Paske, after being deprived of all his benefices, at the Restoration was reinstated in the rectory of Hadham, in his two prebends, and in the mastership of Clare Hall; but he surrendered his right of restitution to the latter in favour of his son-in-law, Theophilus Dillingham who succeeded Ralph Cudworth in 1664. Paske also resigned the York prebend in favour of Dillingham in 1661. On 24 June 1661 he attended in the lower house of Convocation but in December, probably from illness, he subscribed by proxy. He died before September 1662. Walters Hist of Suffolk, pt II, pg 141, says he was Vice Chancellor of Camb 1632 and that he refused the offer of a bishopbric. More Information: B.A. from CLARE (? 1602-3). Of Cambridge. M.A. 1606; B.D. 1613; D.D. 1621. Fellow. Elected Master of Clare, Dec. 31, 1620; ejected, 1645; restored, 1660, but resigned in favour of his son-in-law, Dr Dillingham. Vice-Chancellor, 1623-4. V. of Hendon, Middlesex, 1611-26. R. of St Mary Magdalen, Bermondsey, 1624-44, ejected. V. of Much Hadham, Herts., 1625; sequestered, 1643. Preb. of Canterbury, 1625-62. Archdeacon of London, 1626-62. Preb. of York, 1628-62. Chaplain to James, Marquis of Hamilton. Died c. Sept. 1662. Will, P.C.C. Brother of William (1594) and doubtless father of the next. (D.N.B. ; Clutterbuck, II. 402.). [S275] Website Cambridge University Officers (http://www.cus.cam.ac.uk/~jld1/lists/) : Caput Senatus: "1643 DD Paske, Thomas CL M. 1620-45, 1660; DD 1621; VC 1623." [S275] Website Cambridge University Officers (http://www.cus.cam.ac.uk/~jld1/lists/) : Vice-Chancellor: "1623 Paske, Thomas D.D. CL. " [S271] Website Paske (Eardley Bryan) (http://web.ukonline.co.uk/ewh.bryan/paske.html): "Thomas m Anne dau of Isaac Mountain of Wastow, Yorks and his wife Elizabeth, dau of Thos Bell of Rochester; Isaac Mountain was brother of Geo Abp of York who died 1628, and son of Thomas Mountain of Weston, Yorks, and........... daughter of..................... Hungate of Saxton, Yorks." [S6] Teresa & Stuart Pask's Guesses, Theories and Speculations: Based on the age of their children. [S271] Website Paske (Eardley Bryan) (http://web.ukonline.co.uk/ewh.bryan/paske.html): Entry from the parish register of Great Hadham: "The Reverend, learned and religious Thomas Paske D.D. departed this life, having been minister of Much Hadham by the space of 37 years and upwards, and was interred in the Chancel Sept 20th, 1662." [S4876] Will of Thomas Paske. "Will available, but not yet transcribed." [S6] Teresa & Stuart Pask's Guesses, Theories and Speculations: Will was dated 14 September 1662, and he was buried 19 September 1662. [S271] Website Paske (Eardley Bryan) (http://web.ukonline.co.uk/ewh.bryan/paske.html): Notes from Soanes Freeman Gardner in 1921. [S285] Website FamilySearch Internet (http://www.familysearch.org) : "England Births and Christenings, 1538-1975," index, FamilySearch (https://familysearch.org/pal:/MM9.1.1/NB6C-7WL : accessed 20 Aug 2014), Ann Paske, 19 Feb 1634; citing MUCH HADHAM,HERTFORD,ENGLAND, reference ; FHL microfilm 991376. [S285] Website FamilySearch Internet (http://www.familysearch.org) : "England Births and Christenings, 1538-1975," index, FamilySearch (https://familysearch.org/pal:/MM9.1.1/NB6C-3JH : accessed 20 Aug 2014), Melier Paske, 22 Feb 1636; citing MUCH HADHAM,HERTFORD,ENGLAND, reference ; FHL microfilm 991376. [S271] Website Paske (Eardley Bryan) (http://web.ukonline.co.uk/ewh.bryan/paske.html): "Thomas m Ellen............, he lived at Gt Hadham and was Master of Clare Hall, aforesaid, he was living in 1669 and died Jan 17th 1725/6, his wife died Jan 20th 1725/6, both buried at Hadham." [S285] Website FamilySearch Internet (http://www.familysearch.org) : "England Births and Christenings, 1538-1975," index, FamilySearch (https://familysearch.org/pal:/MM9.1.1/NB6C-Q4B : accessed 20 Aug 2014), Judith Paske, 12 Nov 1646; citing MUCH HADHAM,HERTFORD,ENGLAND, reference ; FHL microfilm 991376. [S285] Website FamilySearch Internet (http://www.familysearch.org) : "England Births and Christenings, 1538-1975," index, FamilySearch (https://familysearch.org/pal:/MM9.1.1/J97W-GX1 : accessed 20 Aug 2014), Richard Paske, 07 Dec 1648; citing MUCH HADHAM,HERTFORD,ENGLAND, reference ; FHL microfilm 991376. Children of Anne MOUNTAIN and Reverend Thomas PASKE D.D. "In the Dictionary of National Biography there is a Thomas Paske, of Hadham, admitted Clare Coll 1692, Fellow of Clare LL.D. and M.P. for University of Cambridge from 1713 till his death 1720. The Pedigree Roll states that Thomas Paske, the younger, was also Master of Clare Hall. No confirmation of this was found, although in 1667 he, with two others, presented to the College a silver ewer and bason, weighing 156 oz, he giving 88 oz, this plate the College still has. In Finchingfield Ch, Essex, a monument states that Thos Paske was rector there in 1702. This is thought to be Thomas, as his son George was rector of Finchingfield. The monument states that his daughter married a curate but was widowed in one year and her son became a well-known etcher, his name was Brown. Research Note: No probate record found for Thomas. Searched both TNA, and Ancestry. [S285] Website FamilySearch Internet (http://www.familysearch.org) : "England Births and Christenings, 1538-1975," index, FamilySearch (https://familysearch.org/pal:/MM9.1.1/NR4D-7TY : accessed 20 Aug 2014), Thomas Paske, 29 Sep 1643; citing MUCH HADHAM,HERTFORD,ENGLAND, reference ; FHL microfilm 991376. 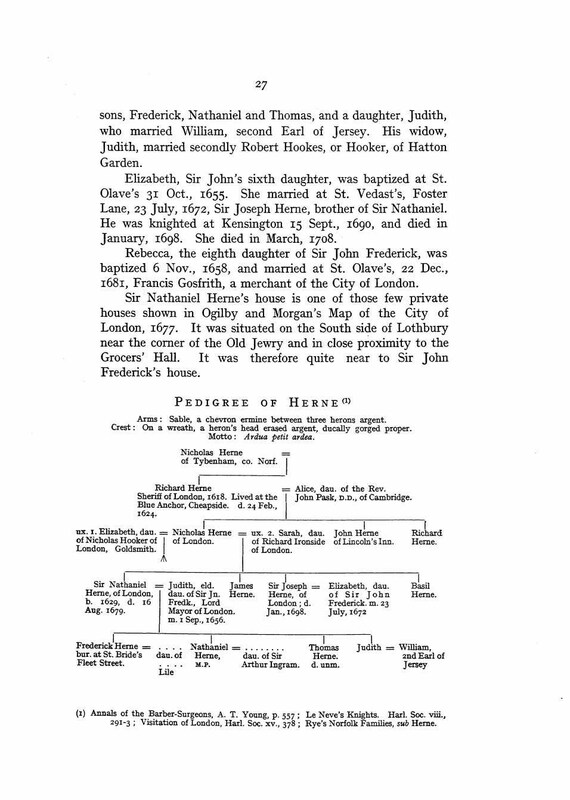 [S285] Website FamilySearch Internet (http://www.familysearch.org) : "England Marriages, 1538–1973 ," index, FamilySearch (https://familysearch.org/pal:/MM9.1.1/NJ7B-VZR : accessed 24 Aug 2014), Thomas Paske and Ellinor Amy, 20 Dec 1669; citing St. Dunstan In The West, London, England, reference yr 1645-1739; FHL microfilm 396196. 1715 Representative in Parliament LL.D. ; again. [S285] Website FamilySearch Internet (http://www.familysearch.org) : "England Births and Christenings, 1538-1975," index, FamilySearch (https://familysearch.org/pal:/MM9.1.1/NR4D-7YM : accessed 24 Aug 2014), Thomas Paske, 31 Mar 1673; citing MUCH HADHAM,HERTFORD,ENGLAND, reference ; FHL microfilm 991376. [S285] Website FamilySearch Internet (http://www.familysearch.org) : "England Births and Christenings, 1538-1975," index, FamilySearch (https://familysearch.org/pal:/MM9.1.1/J3K2-S2W : accessed 24 Aug 2014), William Paske, 02 Dec 1674; citing MUCH HADHAM,HERTFORD,ENGLAND, reference ; FHL microfilm 991376. [S285] Website FamilySearch Internet (http://www.familysearch.org) : "England Births and Christenings, 1538-1975," index, FamilySearch (https://familysearch.org/pal:/MM9.1.1/NB6C-HMG : accessed 24 Aug 2014), Thomas Paske, 18 Jul 1676; citing MUCH HADHAM,HERTFORD,ENGLAND, reference ; FHL microfilm 991376. [S285] Website FamilySearch Internet (http://www.familysearch.org) : "England Births and Christenings, 1538-1975," index, FamilySearch (https://familysearch.org/pal:/MM9.1.1/NR48-PL6 : accessed 24 Aug 2014), Elizabeth Paske, 30 Nov 1677; citing MUCH HADHAM,HERTFORD,ENGLAND, reference ; FHL microfilm 991376. [S285] Website FamilySearch Internet (http://www.familysearch.org) : "England Births and Christenings, 1538-1975," index, FamilySearch (https://familysearch.org/pal:/MM9.1.1/J3K2-94Y : accessed 24 Aug 2014), Judeth Paske, 03 Dec 1678; citing MUCH HADHAM,HERTFORD,ENGLAND, reference ; FHL microfilm 991376. [S285] Website FamilySearch Internet (http://www.familysearch.org) : "England Births and Christenings, 1538-1975," index, FamilySearch (https://familysearch.org/pal:/MM9.1.1/NR48-GRZ : accessed 24 Aug 2014), Mary Paske, 05 Apr 1680; citing MUCH HADHAM,HERTFORD,ENGLAND, reference ; FHL microfilm 991376. [S285] Website FamilySearch Internet (http://www.familysearch.org) : "England Births and Christenings, 1538-1975," index, FamilySearch (https://familysearch.org/pal:/MM9.1.1/J3K2-946 : accessed 24 Aug 2014), Alice Paske, 15 Oct 1681; citing MUCH HADHAM,HERTFORD,ENGLAND, reference ; FHL microfilm 991376. [S285] Website FamilySearch Internet (http://www.familysearch.org) : "England Births and Christenings, 1538-1975," index, FamilySearch (https://familysearch.org/pal:/MM9.1.1/J3K2-9DM : accessed 24 Aug 2014), George Paske, 11 Dec 1682; citing MUCH HADHAM,HERTFORD,ENGLAND, reference ; FHL microfilm 991376. [S285] Website FamilySearch Internet (http://www.familysearch.org) : "England Births and Christenings, 1538-1975," index, FamilySearch (https://familysearch.org/pal:/MM9.1.1/NR48-R9H : accessed 24 Aug 2014), Martha Paske, 04 Apr 1684; citing MUCH HADHAM,HERTFORD,ENGLAND, reference ; FHL microfilm 991376. [S285] Website FamilySearch Internet (http://www.familysearch.org) : "England Births and Christenings, 1538-1975," index, FamilySearch (https://familysearch.org/pal:/MM9.1.1/J3K2-3JG : accessed 24 Aug 2014), James Paske, 25 Dec 1685; citing MUCH HADHAM,HERTFORD,ENGLAND, reference ; FHL microfilm 991376. [S285] Website FamilySearch Internet (http://www.familysearch.org) : England Births and Christenings, 1538-1975," index, FamilySearch (https://familysearch.org/pal:/MM9.1.1/NB6C-Q49 : accessed 24 Aug 2014), Margaret Paske, 03 Nov 1688; citing MUCH HADHAM,HERTFORD,ENGLAND, reference ; FHL microfilm 991376. [S285] Website FamilySearch Internet (http://www.familysearch.org) : "England Births and Christenings, 1538-1975," index, FamilySearch (https://familysearch.org/pal:/MM9.1.1/NR4D-9HT : accessed 24 Aug 2014), Edward Paske, 14 Mar 1690; citing MUCH HADHAM,HERTFORD,ENGLAND, reference ; FHL microfilm 991376. [S285] Website FamilySearch Internet (http://www.familysearch.org) : "England Births and Christenings, 1538-1975," index, FamilySearch (https://familysearch.org/pal:/MM9.1.1/NB6C-7VT : accessed 20 Aug 2014), George Paske, 11 Sep 1650; citing MUCH HADHAM,HERTFORD,ENGLAND, reference ; FHL microfilm 991376. [S285] Website FamilySearch Internet (http://www.familysearch.org) : "England Marriages, 1538–1973 ," index, FamilySearch (https://familysearch.org/pal:/MM9.1.1/V526-PKM : accessed 24 Aug 2014), Geo Pask and Frances Burscough, 24 Jan 1705; citing Stoke Next Guildford,Surrey,England, reference ; FHL microfilm 808497, 942.21 S8 V26S. Residence: Much Hadham, Hertfordshire, England. [S4879] Will of George Paske. [S285] Website FamilySearch Internet (http://www.familysearch.org) : "England Births and Christenings, 1538-1975," index, FamilySearch (https://familysearch.org/pal:/MM9.1.1/NLL4-C5X : accessed 24 Aug 2014), George Paske, 09 Jan 1706; citing ST ANDREW HOLBORN,LONDON,LONDON,ENGLAND, reference ; FHL microfilm 374352. [S285] Website FamilySearch Internet (http://www.familysearch.org) : "England Births and Christenings, 1538-1975," index, FamilySearch (https://familysearch.org/pal:/MM9.1.1/NLTK-KHH : accessed 24 Aug 2014), Frances Pask, 27 Oct 1708; citing ALDERLEY,GLOUCESTER,ENGLAND, reference ; FHL microfilm 394445, 417100. Research Note: No Probate records found for Theophilus, or Elizabeth at TNA. Children of Elizabeth PASKE and Dr. Theophilus DILLINGHAM D.D. [S285] Website FamilySearch Internet (http://www.familysearch.org) : "England Births and Christenings, 1538-1975," index, FamilySearch (https://familysearch.org/pal:/MM9.1.1/V5LV-NDK : accessed 20 Aug 2014), Elizabeth Paske, 12 Feb 1641; citing CATHEDRAL,CANTERBURY,KENT,ENGLAND, reference ; FHL microfilm 942 B4HA V. 2. [S271] Website Paske (Eardley Bryan) (http://web.ukonline.co.uk/ewh.bryan/paske.html): "Elizabeth m Theophilus Dillingham D,D. Master of Clare Hall." PASKE 30 Mar 1661. Elizabeth Paske Mar. Dr. Theophilus Dillingham, Cambridge. Both of the parish of St. Edward. Wealth at death: probably substantial; estate of Deane, Bedfordshire, Wilburton, Isle of Ely, manor of Camay, freehold estate in Cambridge, lease of parsonage impropriate of Witcham in Isle of Ely, lease of tenement of land called Chapman in Isle of Ely; £500 of lawful money; large scholarly library: will, CUL, Mm.1.37, 251–7. More Information: Adm. at EMMANUEL, Sept. 13, 1629. S. of Thomas (1585), R. of Deane, Beds. Bapt. there, Oct. 18, 1612. School, Upper Deane. Matric. 1629; B.A. 1633-4; M.A. 1637; B.D. from Sidney, 1644; D.D. from Clare, 1655. Fellow of Sidney, 1638. Master of Clare, 1654-60 and 1661-78. Vice-Chancellor, 1655-6, 1656-7, 1662. Ord. deacon (Peterb.) Mar. 10, 1638-9. R. of Offord Cluny, Hunts., 1654-78. Preb. of York, 1662. Archdeacon of Bedford, 1667-78. Died in Cambridge, Nov. 22, 1678. Buried in St Edward's. M.I. there. Will (V.C.C.) 1678. Brother of John (1631), father of Thomas (1677). (D.N.B.). Dillingham, Theophilus (1613-1678), college head, was born on 18 October 1613 at Over Deane, Bedfordshire, the elder son of Thomas Dillingham (d. 1647), rector of that parish. He was educated at the school at Over Deane and then matriculated at Emmanuel College, Cambridge, on 13 September 1629. From that college he graduated BA in 1634 and proceeded MA in 1637. The following year he moved to Sidney Sussex College as a fellow, taking his BD there in 1644. In 1654 Dillingham was elected master of Clare and proceeded DD from that college the following year. At the Restoration he was ejected from the mastership, but the successful claimant, Thomas Paske (d. 1662), who had been master from 1620 to 1645, became his father-in-law on 30 March 1661 on Dillingham's marriage to Elisabeth Paske at St Edward's, Cambridge. With the assent of the fellows Paske resigned his mastership to Dillingham. His popularity within the university both before and after the Restoration is evident in the fact that he served as vice-chancellor in 1655-6, 1656-7, and 1662. Evidently, too, he was not out of favour with the restored regime, since he became prebendary of Ulleskelf, in the church of York, on 29 January 1661 (a position he again owed to the fact that his father-in-law resigned in his favour) and archdeacon of Bedford on 3 September 1667, as well as retaining the rectory of Offord Cluny, Huntingdonshire (to which he was appointed in 1654), until 1678. Dillingham died at Cambridge on 22 November 1678 and was buried at St Edward's Church, Cambridge. He was survived by his wife, three sons (Thomas (d. 1722), John, and Theophilus), and three daughters (Elizabeth, Dorothy, and Ann). [S271] Website Paske (Eardley Bryan) (http://web.ukonline.co.uk/ewh.bryan/paske.html): Taken from the Dictionary of National Biography of Thomas Paske: "Thomas Paske surrendered the Mastership of Clare Hall, Hadham to his son-in-law Dr. Theophilus Dillingham who had been already elected to the post in 1654 (Dr Dillingham 1613-1678 was buried in St. Edwards Cambridge)." [S271] Website Paske (Eardley Bryan) (http://web.ukonline.co.uk/ewh.bryan/paske.html): Taken from the Dictionary of National Biography "William Paske, vicar of Hendon, Middlesex. William Paske left Hendon 1611 for Ashdon, Essex, he was prebend of Oxgate in St. Paul’s Cathedral and died Feb 15th 1639/40."